occiput is in the left anterior segment of the maternal pelvis, the position is described as left occiput anterior (LOA), which is the most common of all vertex presentations. The common clinical vertex positions are illustrated in Figure 23-4. "Left" and "right" always denote the side of the mother. Likewise, "anterior," ''posterior,'' and ''transverse'' refer to the mother's pelvis. Figure 23-4 Common clinical vertex positions. For each position shown, the top diagram is the view from above the symphysis pubis; the bottom is the view from below the symphysis pubis. ''Right'' and ''left'' refer to the mother's side. ''Anterior,'' ''posterior,'' and ''transverse'' refer to the maternal pelvis. Red area is the fetal occiput. 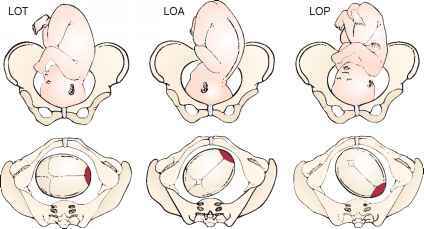 LOA, left occiput anterior; LOP, left occiput posterior; LOT, left occiput transverse; ROA, right occiput anterior; ROP, right occiput posterior; ROT, right occiput transverse. Figure 23-5 Basic types of pelvic anatomy. Top view is from above, looking down at inlet; middle view is from the side; bottom view is from the front. The term station characterizes the level of descent of the presenting part of the fetus; ''0 station'' signifies that the fetal occiput has reached the level of the maternal ischial spines and that the widest transverse part of the infant's head (biparietal diameter) is at the level of the pelvic brim. This is also known as engagement. If the vertex is at ''—1 station,'' it means that the fetal occiput is at a plane 1 cm above the level of the maternal ischial spines (and that the biparietal diameter is therefore 1 cm above the pelvic brim), and the infant's head is therefore not engaged. The cardinal movements of labor are engagement, descent, flexion, internal rotation, extension, external rotation, and expulsion. There are four basic pelvic configurations: gynecoid, anthropoid, android, and platypelloid. These are based on the shape of the brim, midpelvis, and outlet. Any pelvis is likely to combine features of more than one configuration. 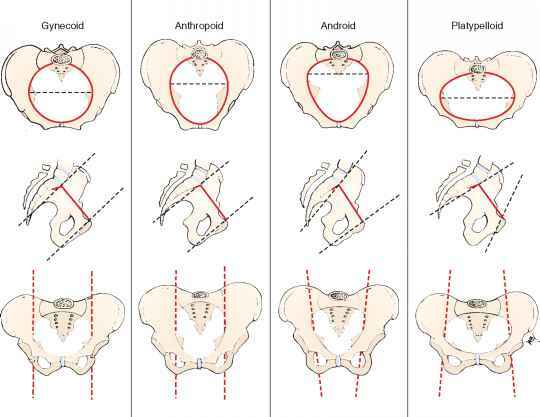 Figure 23-5 illustrates these basic types and summarizes the differences in pelvic anatomy.